Table Styles in Excel (Examples) | How to Apply Table Styles? 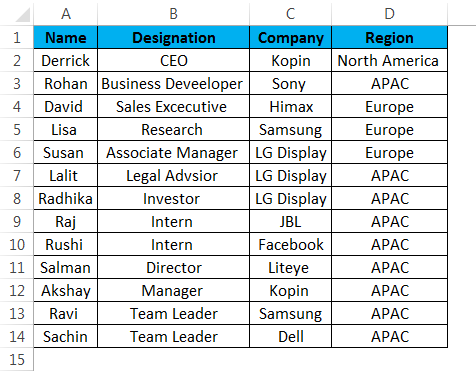 How to Apply Table Styles in Excel? Excel tables are beneficial to represent complex data by arranging them in rows and columns and making it look in tabular form. These excel tables makes easier to convey your information to the viewers. Excel tables are being provided by a feature such as ‘Styles’ which allows the user to choose any table style of their preference to make their data look presentable and standout in the spreadsheet. The table styles can be applied by creating a table and then applying either to the existing table or to create a custom table style. How to Apply Styles in Excel? In order to apply this in to the excel table, there is a need to create an excel table. So let’s see how to create an excel table for any random data entered in the excel sheet. Consider the below example, where any random data is entered in the excel sheet. Step 1 – Select the entire data in the excel sheet. Step 2 – From the ‘Insert’ tab select the option ‘Table’ or else you can also press ‘Ctrl +T’ which is a shortcut to create a table. Step 3 – After selecting the table option or creating a table, you will get the ‘Create Table’ dialog in that dialog box click on ‘OK’. Make sure that ‘My table has headers’ option is ticked. The below image shows the data entered in the tabular form. 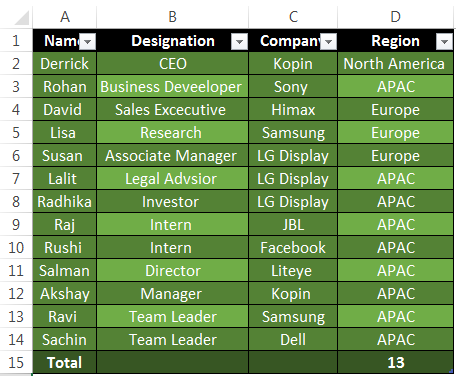 After creating the excel table, let us see how to apply different table styles to it. 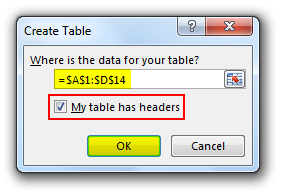 In order to check different table styles, select the ‘Table Styles’ option from the ‘Design’ tab as shown below. 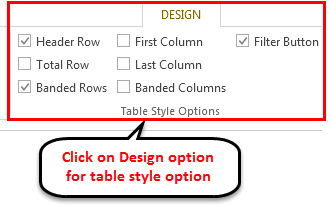 In the below image it shows how modification could be done to your table by clicking the design tab and then the selecting the ‘Table Styles’ option and then selecting your preferred style. Let us explore the ‘systes’ option as mentioned in the below image. Click the arrow as highlighted in the below image. Apart from the above table styles used for formatting our excel table, we also have another ‘Table Style Options’ as shown in the below. Header Row: It is used to display or hide the table headers. Total Row: It is used to add the total rows at the end or bottom of the excel table, along with the list of functions for each total row cell. Banded Rows & Banded Columns: It is used to display the alternative shading to rows or columns or both together. First & Last Column: Used to apply special formatting for the first and last column of the table. Now, let us explore the above options and see the changes after applying these features to your table. We have selected the table style from the ‘dark’ category which is highlighted in the below image. 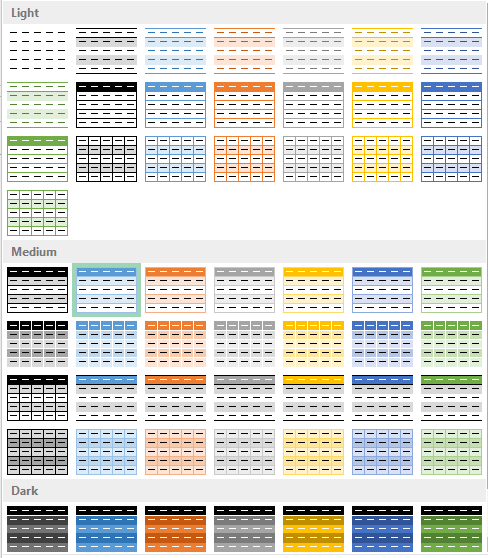 Here, we have selected Header Row, Total Row, Banded Rows, and Banded Columns. In the below image, you can see the changes appeared. So we can observe that shading has been applied to alternate columns after selecting the banded column option. Also, it displays the total number of rows after selecting the total row option. 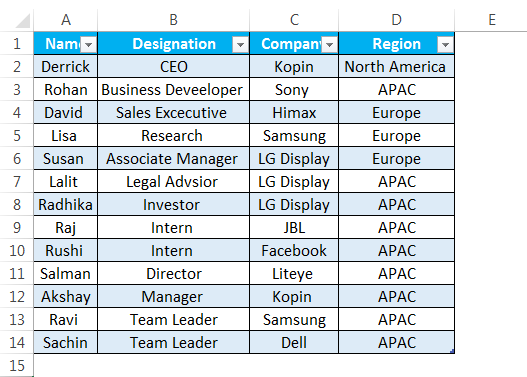 Step 1 – First, create an excel table. 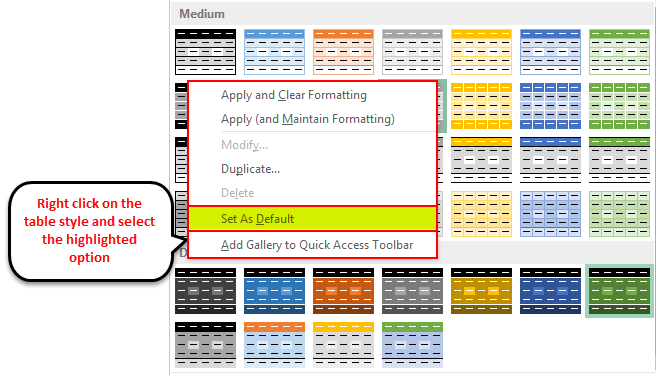 In this step you the default excel table will appear with default styles. 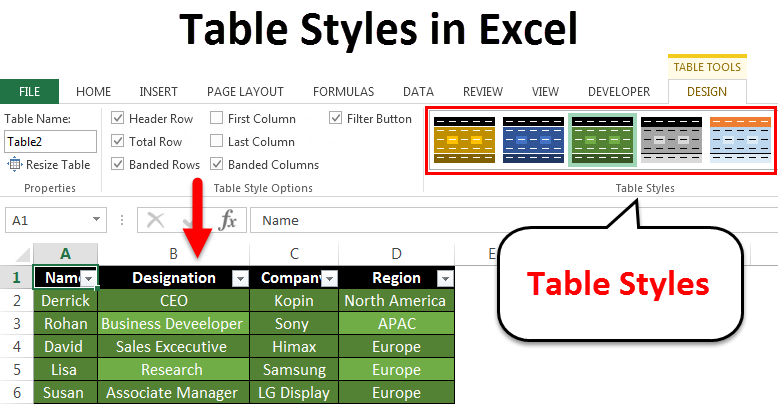 Step 2 – After preparing an excel table, click any cell from the table than under the ‘Design’ tab go to ‘Table Styles’ and choose any style which you prefer as your default table style. Step 3 – After selecting the particular table style according to your choice, Right click and select ‘Set As Default’ option. After this, your default table option is selected. Useful in cases where the user is presenting the data at any conference or presentation, and it should be easily read by the audience. Allows the user to set their preferred table style and save it as custom table style option as well, which saves time and in case the user needs to create the excel table following the long procedure again. In case, if you have manually highlighted the rows of the table or changed any formatting for the table and after you want to apply new styles, the excel will keep the manually applied formatting in place. For this, you need to remove the existing formatting, by right-clicking on the styles and selecting ‘Apply and Clear Formatting’. Excel also allows the user to create a custom table style of the user’s choice. The most useful feature of this is the preview option, which allows users to preview their preferred style options. Also, the user can apply the table without creating the excel table by simply going to the ‘Table Tools’ tab, then on the Design option and then selecting ‘Convert to Range’ option.